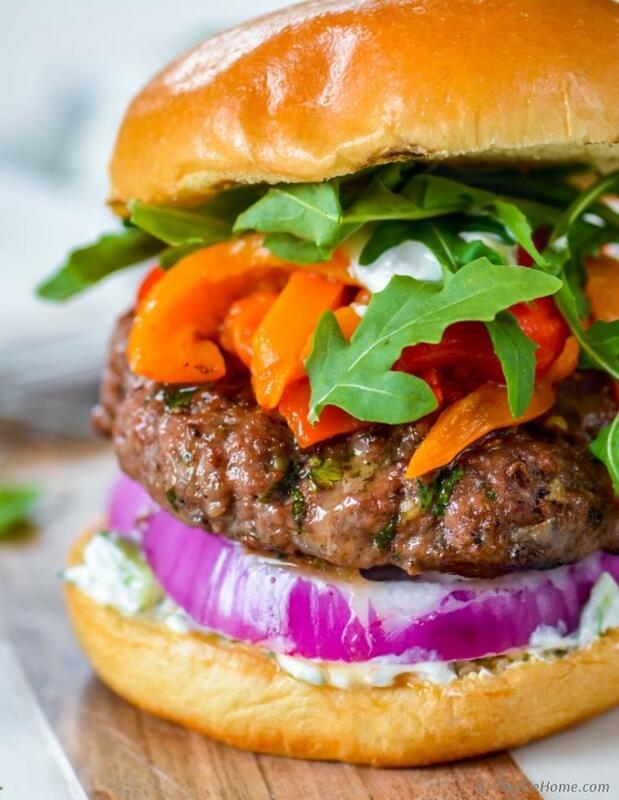 These simple and juicy Lamb Burgers are flavor packed with Greek spices, and have delicious flavors of mint making them perfect way to enjoy summer grilled Greek dinner at home! 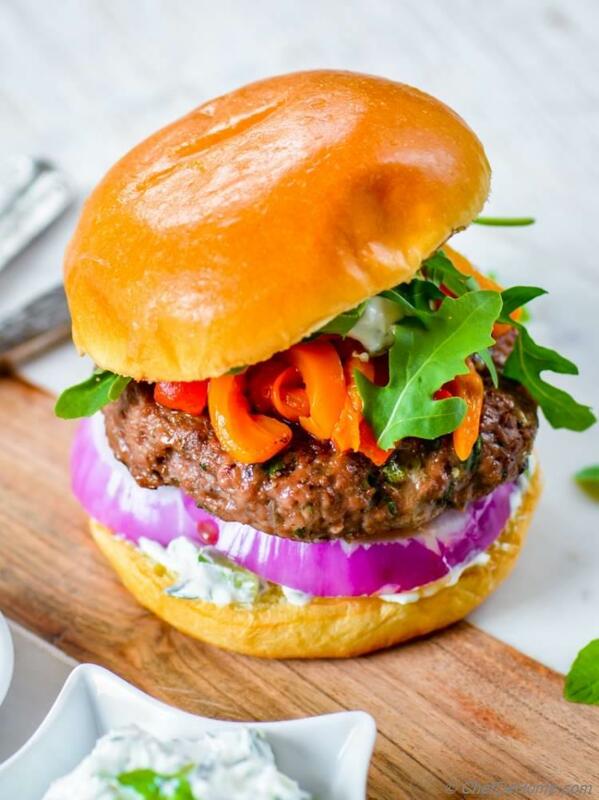 I served lamb burgers with layers of cucumber and Greek Yogurt Sauce, sweet roasted red peppers, peppery arugula with brioche burgers buns... for a lamb lover, these flavors are mouthwatering experience! Specially when flavor-packed Greek burgers are cooking on the grill, as far as the aroma of grilling goes... people can tell someone is cooking authentic Greek-style food at home! 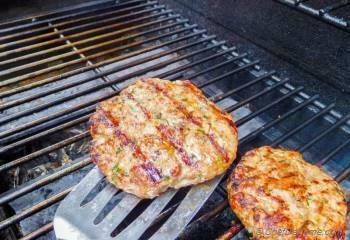 I can tell you, these will be the BEST Greek Lamb Burgers you have ever cooked at home! Not just a simply, scrumptious, and 25 minutes recipe.... I'm also sharing a secret to make lamb patties extra-moist and juicy. Do you always think, only cooking at right temperature keeps meat moist?! In my honest opinion, ingredients paired with meat also play an important role in keeping meat moist and juicy while cooking. Ingredients for these burgers are still easy to find in any spice-lover's pantry. 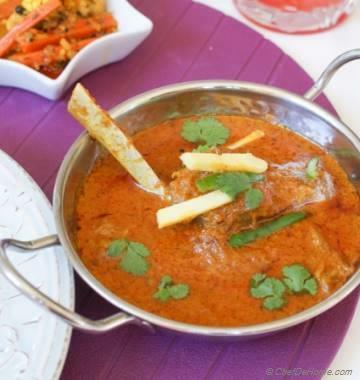 In fact, you will be surprised that you always had moist-juicy-lamb-secret-ingredient sitting in the pantry! So let's talk lamb burgers today! For us, past weekend was all about cooking-at-home. And lamb was on the menu, twice. I mostly cook chicken or fish for summer dinner and meats are generally in weekend menu. Often Vishal is in-charge of grill and he loves simple black pepper and salt seasoned lamb patties for Sunday lunch/dinner. Whenever it is more than salt-pepper, we switch roles and I'm the in-charge. :) I had this recipe in mind for quite sometime.. So, on weekend I told Vishal, "I'm cooking Lamb Burgers today!" 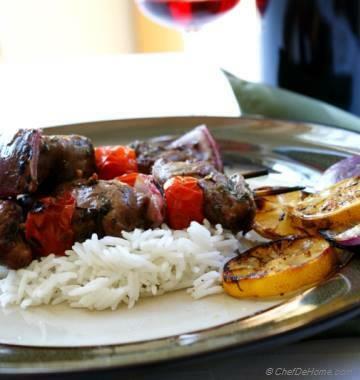 Flavor and spices used for Greek Lamb Burgers are very close to Indian flavors. Like cumin, garlic, onion, and mint are very often used in Indian ground lamb kababs and so are in Mediterranean cuisine. If you are fan of either of these two cuisines, you should invest in keeping some cumin, coriander and oregano in your pantry. When we were shopping to cook lamb burgers for lunch... Vishal shared with butcher about our plans of grilling Greek-style burgers. Where he was impressed with my combination of flavors: lamb burgers with mint, roasted peppers and brioche buns..... 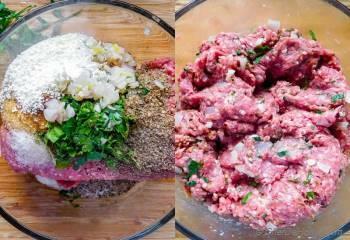 He suggested us to add one more ingredient in lamb patties to help in binding, keeping meat extra moist and juicy. That ingredient is Milk Powder. I was really surprised but I did try it in these burgers. I must say, I'm so impressed with the results. Ground lamb meat, even though I bought 85-15 instead of regular 80-20 , came out super moist, tender and there was no sweetness of milk any where. score! Milk Powder?! Really? 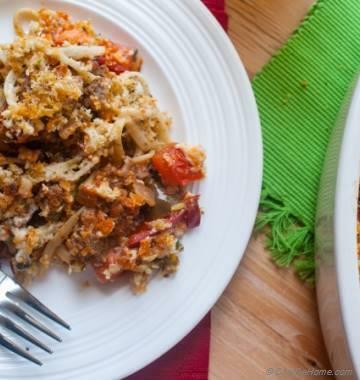 I bet you will have some in your pantry?! Add some to lamb burgers, friends!! 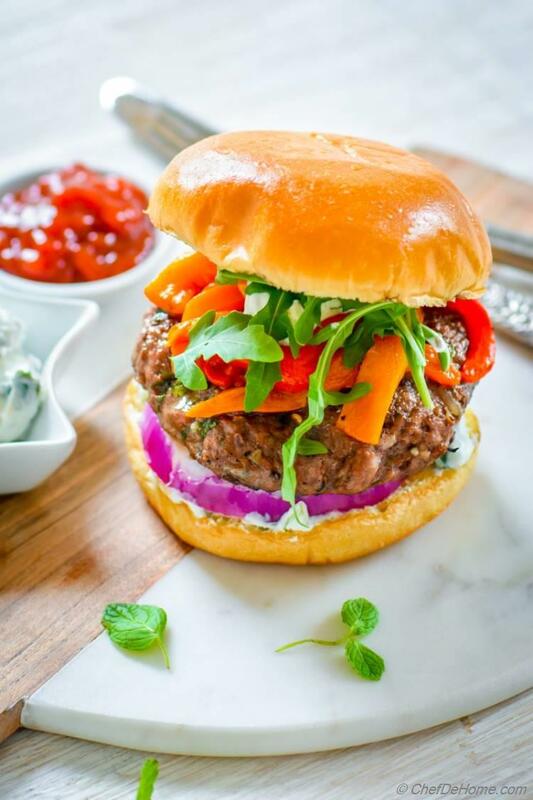 Other than assembling ingredients, these lamb burgers come together super fast and with just 10 minutes prep, these are even easy to serve for dinner. You enjoy Lamb burgers and now, I get up to make something delicious for you for Wednesday!! Total Time 25 minutes Prep Time 10 minutes Cook Time 15 minutes Difficulty Easy Yields 4, 1/3 Pound Burgers Serves 4 Notes No. of servings depends on serving size. 1. 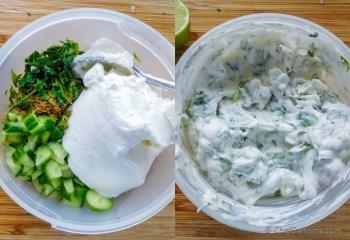 Cucumber Yogurt Sauce for lamb burgers: To make yogurt sauce, in a medium bowl combine, yogurt, cucumber, cumin powder, lime juice, mint, and parsley. Refrigerate until ready to use. Just before using, taste and adjust salt and black pepper. 2. Set the grill to preheat. Heat 1 tbsp oil in a small sauce pan. Add onion and fresh chopped garlic. Sweat until onions are soft. (2-3 minutes). 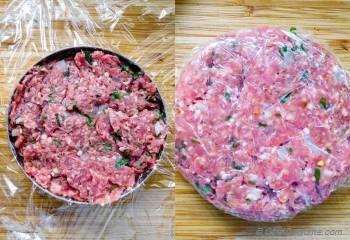 For lamb burgers, in a wide bowl, add ground lamb, softened onions, all spices with mint, parsley and salt. Mix to combine and distribute all ingredients. 3. Make 4 large 1/3 pound patties or 6 small 1/4 pound patties as per liking. 4. 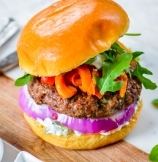 To cook lamb burgers: Place burger patties on medium hot grill and cook for 5-6 minutes, then flip and cook other side until burgers are done to your taste. Don't flip'em too often, let one side sear well and caramelize before tuning to cook other side. You can also lightly toast brioche buns, if prefer. For best result, after grilling, let cooked lamb rest for 5 minutes. 5. 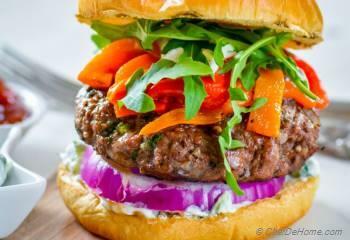 To serve, slather 1-2 tbsp yogurt dressing on bottom half of bun, top with onion slices, lamb patties, roasted peppers,more yogurt dressing and fresh arugula. Serve and enjoy! Thanks for sharing the awesome recipe. I don't have a grill, so baked it in the oven for 25 mins at 350 F, turned out great. looking forward to trying more of your recipes.